There are many things that the iPhone is, but there were a few nagging things that the iPhone wasn’t. This holiday weekend, while helping my father set up his iPhone, I found a few of the missing pieces. 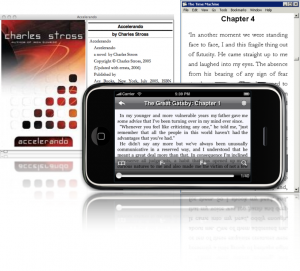 Stanza – you can pick it up in the apps store and you can go to Lexcycle.com and download a desktop version for your PC or Mac. It even handles Kindle formats! I’ll be playing with it more later, but I wanted to share it with any of my readers who have been seeking a quality ebook reader. Pages turn with a tap in either direction (or a finger-swipe) and you can adjust the size of the font without being required to scroll left to right on the iphone to read the lines. It breaks them for you automatically. It’s a sweet little app that allows you to download free books from a sizable online library when you are out and you can personalize the contents on your iPhone by adding your own if you pre-plan enough to load them up before leaving home. And did I mention it was free?!?! Another missing piece was a good multi-platform IM manager. Enter Palringo – Vocal Instant Messaging. Granted, the lack of background apps on the iPhone are a pain for this type of “always on” platform — but I’m just happy to have a non-web-based app with which to shoot off a quick note to my clients/peers/family. I tried a couple of the earlier attempts, and found them sadly lacking. This one seems to be solid, responsive and pretty as well. I’m still playing with all the options. I’m less than impressed with the notepad that Apple ships with the iPhone. It takes forever to find and load my old data (and it’s not that I have tons of pages, I only have two or three entries at any time). I wanted a note taking app that would take my info in whatever format I wanted to use — typing, scribbling, voice, whatever. Wishes do come true… YouNote (in the Apps Store) gives me exactly what I need. I only wish I could get these out of my iPhone and onto my desktop or sync them with a web app so I could use them on my Mac too. I’m just now discovering this little app, but I’m already in love. The drawing feature using a fat finger, produces an impressive thin, responsive line. Bravo! Hanoi – great ancient (classic) puzzle. Free. Asphalt4 – Not free, but worth the bucks (and I have NEVER liked driving games). I just wish the iPhone was actually the steering wheel, that would be even cooler. reMovem free – This one is terribly addicting. Pop all the bubbles to clear the board. Curse when you get down to one lone bubble. Rinse. Repeat. Wowio comes to the iPhone! 2 Responses to "And the Winner is… An eBook Reader for iPhone"
I totally agree; in fact, I think the phone is already the primary computing platform by sheer numbers.